I was given a calla lilies that were almost dead. I planted them in my backyard where it gets the morning sun. 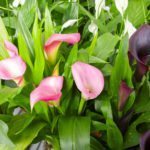 Within days the calla lilies came to life and the blooms were beautiful. Within a week or two, the blossoms closed and have not opened. Can you tell me what I am doing wrong? They were so beautiful. Thank you. Calla lilies prefer full sun. Here is a link of the care requirements of you new plant.